Ha! Think I’ve got this one… Guess I’ll find out in the morning. Thanks for the game as always. Raven — yep. You win again. Caryl — and a correct guess! And I thought this one would be way hard! Gah! This went up during dinner. I’m positive I’ve got it right, but I don’t think I’ve got in first. The answer — or at least an answer — came to mind right away but I’m obviously not first. Barbara — it is hard to beat Raven. I don’t think she sleeps. Funny, Karen. As Doug said, the colors were accidental. Thanks for giving me credit for being so clever! That’s funny, KC (sorta.) I’m guessing the colors are coincidence. Doug — your guesses were correct! Got it!!! E-mailing you now…. I have no idea again this week but I’ll say “hello” anyway. By golly, I did have an idea. I should have sent my “nail clipper” guess in anyway, even though I thought it was a compound noun. Karen, the post doesn’t say compound noun — you made me look! Shelly — if you ever want off the mailing list, just drop me a note! Betty — it is always good to hear from you. You made it into the winner’s circle! Susan — whatever works, i always say. So are you gone all day or have none of us gotten it? Wondering if you are gone ’cause you usually dangle a hint or two by now. Hmmmm. Linda — gone. I kept myself very busy today! I actually knew it. Either I’m getting smarter or it was really easy. I’m trying to learn your brand of puns, Quilly. You can grade me if you’d like. I’d like. I understand nail and clips. That is descriptive and is not a pun. So is clips and nails. The nail clips is a winner, re Betty L.. But nail clips does not win, reCaryl — nail clips, Granny Annie — nail clips, Linda — nail clips, Church Lady — nail clips, and Shelly — nail clips. Seems no justice. And both are better than nail clipper. Somewhat better than nail clip as there are two clips. I am studying puns. Yours are classified as picture puns, plus other names. The only problem I see so far is not using them here in a sentence or clause to add the sense of pun humor. That is a hard qualification. Cartoonists seem to do that pretty well. That nail is indeed a nail — the kind one hits with a hammer. I used it to represent a fingernail (which people have hit with hammers, but generally not on purpose). Whether you agree or not, using one type of nail to represent the other is a pun. 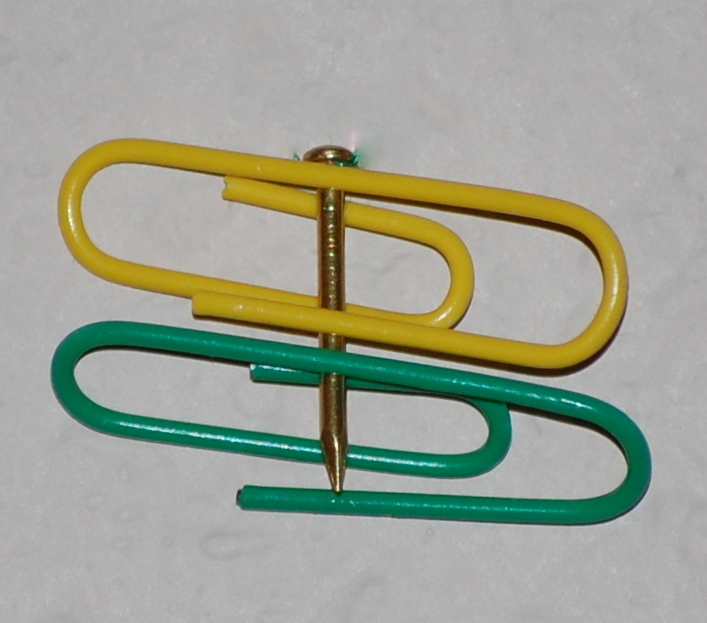 The paper clips are indeed clips — and I have attached two of them to the nail. One has to think a bit to get “clippers” from paper clip, but as nine people clearly demonstrated, it wasn’t a difficult fete. 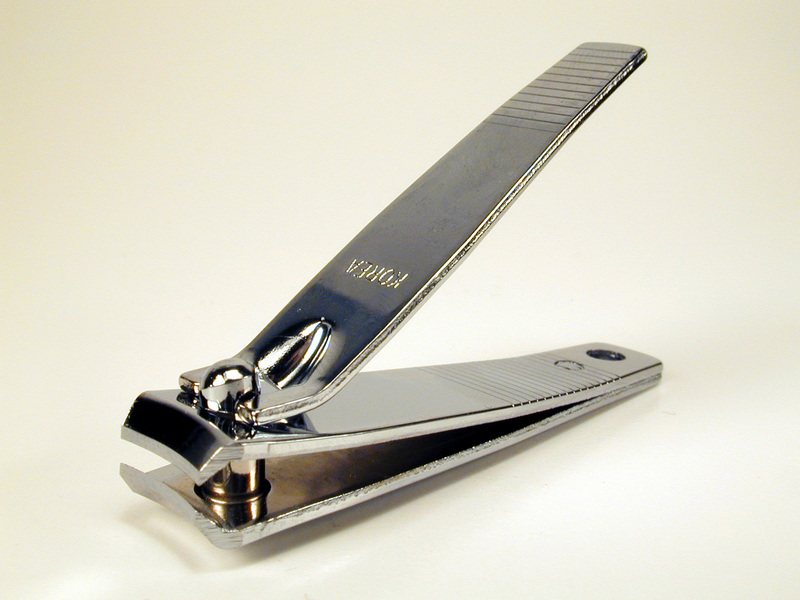 As for Betty L. being the test case for “nail clips” not being a pun — it was a typo on my part. I am sorry for that confusion. Betty L. guessed “nail clippers”. However, since I had “nail clips” listed 5 times in the non-winning category (as you pointed out yourself), a moment’s thought probably could have deduced that. Now, is it my turn to come to your blog and tell you how to run it? Hey Quilly, thank you. I sure might need some help with blog writing. A lot of people try. Those help attempts seem to run in spurts sort of like they seem to on yours. I am still smiling about all the help your readers were trying to give you with doing your water aerobics. Other bloggers are my teachers. Some of them and experience go a long way. I thought you would be excited when I told you I was learning more about puns. Of course I knew what puns were, by definition, before you were born. The picture puns need more of my attention if I am to care about them. Probably I could live without those.